The Geneva to Nice Cycling Challenge is an awesome adventure through the French Alps to the Mediterranean Sea. This epic course will for the most part follow the renowned “Route des Grande Alpes”. In this way, riders will have the opportunity to experience some of the unbelievable mountain climbs of the Tour de France. These climbs will include Col du Galibier, Col du Telegraphe, Alpe d’Huez, Cormet de Roselend, Col d’izorard and Mont Ventoux. How far are you willing ride your bike for a touch of sun?. 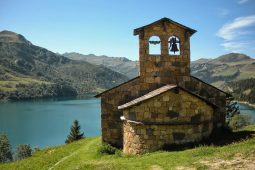 This 8-day challenge begins beside lake Geneva, before heading through the French Alps towards the sun kissed shores of Nice. As we make our south through the towering mountain pecks the scenery beings to change. How you will be surrounded by breathtaking limestone cliffs, majestic gorges and colourful lavender fields. Our route then strays away from the traditional “Route des Grandes Alpes Itinerary” to provide you with the opportunity the climb the “Gaint of the Provence” Mont Ventoux. Your extraordinary Geneva to Nice Cycling Challenge reaches a conclusion along the Promenade de Anglais and the sun drenched beaches of Nice. This epic adventure will include around 18000m of climbing over a distance of 1050km. Whilst on the road you will have to support of knowledgeable guides providing advice, encouragement and help with any miner mechanical problems. We also provide a support vehicle offering nutritional and mechanical support at pre-arranged stops along the route. The support vehicle will carry energy bars, fresh water and energy drinks to help keep your performance levels to the maximum. Additionally, it will also carry any warm or wet weather clothing you might need during the ride. The Geneva to Nice Cycling Challenge will involve some long days in the saddle so you need to have a good level of fitness, stamina and bike handling skills in order to accomplish this iconic journey. This is a general itinerary to provide you with some idea of how the Geneva to Nice Cycling Challenge is structured. However, if you would prefer your week to include more distance, less distance or different climbs then please contact us. We are willing to provide you with a week that meets all your needs. You will be met by a member of the Classic Cycling Tours team in the arrival area on the Swiss side of Geneva Airport and transferred to your overnight accommodation in Geneva. Once at the hotel there will be the opportunity to assemble your bike. We have a good selection of tools, track pumps and bike stands available for your use. Once your bike is assembled there will be an option to go for a short ride to ensure that everything is working order. Before dinner there will be a introductory briefing outlining the schedule and route for Sundays ride. The Geneva to Nice Cycling Challenge starts at the shores of Lake Geneva before heading out along a undulating road toward our first climb. 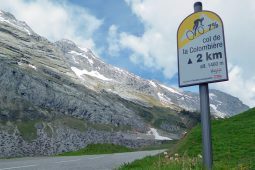 The Col de la Colombiere at a distance of 16.3km and a summit height of 1613m. The first section is in the forest, climbing along the side of a valley The gradient increases steadily, first 3.5%, then 4.5%, then 7%, with 2km at 8.5% before the road levels out to a gentle 2% – 3% on the intermediate plateau. After the plateau the road quickly gets steeper, with 4 km to go it rounds a shoulder and the vista opens up to reveal the distant summit. The second climb of the day is the longest, the Col des Aravis is 18.9km in length with a an average gradient of 4.6% and a summit height of 1486m. The descent down the other side of the Col des Aravis to the village of Flumet is quite technical in places but, this should provide you with lots of fun. Once at Flumet we have approximately 15km to our overnight accommodation in Megeve. Before dinner there will be a briefing outlining the schedule and route for Mondays ride. Todays route takes you over two beautiful climbs, the first being the Col des Saisies at a distance of 14.1km with an average gradient of 5% and a summit height of 1657m. From the summit we then have a nice descent on wide roads down to the traditional French village of Beaufort. The village is famous for it’s cheese so it would only be polite to take the opportunity to sample it before making our way onto our next climb. The Cormet de Roselend is one of the most famous climbs in the history of the Tour de France. At a distance of 20km with an average gradient of 6% and a summit height of 1967m this could be your first real challenge. The climb is broken into two halves with a welcome flat section coming after 12km. A this point the valley opens out with stunning views of the towering mountains pecks reflecting into a giant lake. The road snakes around the lake then starts to climb again towards the summit. The hardest section of the climb comes in the final 4km, so keep something back. The beginning of the descent is very fast with long sweeping bends and open views of the road ahead. After 10km the road moves into the tree line, with plenty of tight hairpin bends to slow you down. Once at the town of Bourg Saint Maurice the road continues to descend slightly down the valley before we reach our final climb of the day. The climb up to our overnight accommodation in the charming village of Les Allues is 9km in length with an average gradient of 7% and a summit height of 1150m. Before dinner there will be a briefing outlining the schedule and route for Tuesdays ride. The third day starts with a descent down to the valley floor before making our way to the first climb. 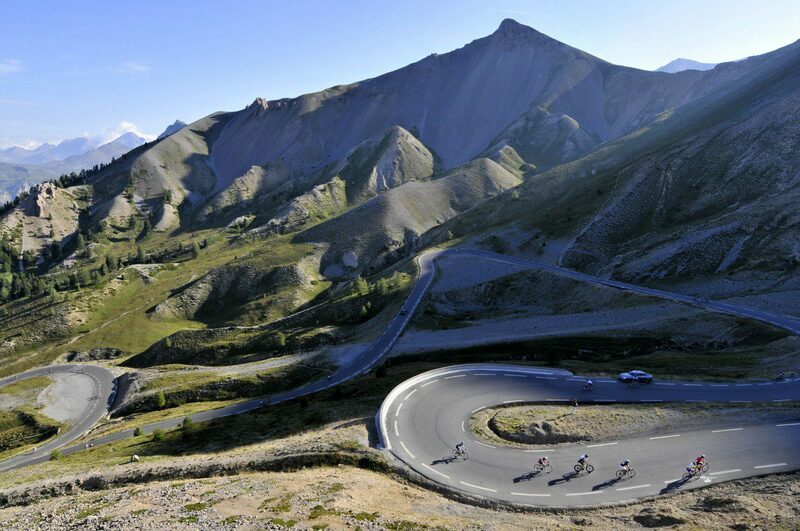 The Col de la Madeleine is one of the legendary climbs of the Tour de France. At a distance of 26km with an average gradient of 5.4% and a summit height of 2000m, this is a testing climb. The first section is quite steep with an average gradient of 9% over the first 3km, before reaching a slightly downhill section at 9km. The toughest part of the climb comes at the 12km marker where the gradient moves up to 11%. The final 3km consist of 4 giant lacets towering over the valley below. The descent down to the village of La Chambre is very fast with plenty of hairpin bends to negotiate, so great care should be taken. 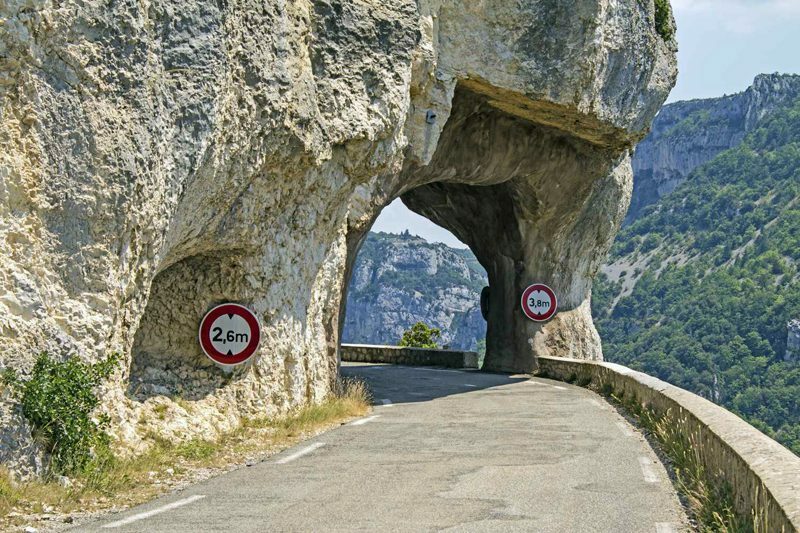 The next climb featured in the Tour de France for the first time in 2015, Lacets de Montvernier. This short climb of 3.8km as an average gradient of 8.5% and a summit height of 781m. What makes this climb so special is the 18 hairpin bends that climb directly up the steep rock face. After the Lacets de Montvernier we descend down the valley to the town of Saint Michel de Maurienne and the last climb of the day. The Col du Telegraphe is 11.8km in length with an average gradient of 7.3% and a summit height of 1566m. The climb is normally paired with the Col du Galibier when its been used in the Tour de France. On this occasion we will make the short descent into Valloire for our overnight stay and leave the giant Col du Galibier for tomorrow. Before dinner there will be a briefing outlining the schedule and route for Wednesdays ride. The climbs just keep on coming, today’s route takes you over two iconic “Route des Grandes Alpes Cols” the first is the Col du Galibier.. The first 2km are quite steep before we reach an area that the french call the “false flat”. The road starts climbing again at the 12km marker as it makes it’s way up the valley before crossing a small river at the 9km marker. Immediately after this point, the gradient will not drop below 8% average. The final kilometre is very tough but once you have reach the summit you will be at the highest point of the challenge. Take a moment to look back down the valley and give yourself a well earned “pat on the back”. On the descent the road conditions are quite rough in places and you will be exposed to the elements. This is a popular climb so there will be lots of other cyclists going up and down. You will reach the summit of the Col de Lautaret after 10km, at this point we will turn left and continuing down the valley to Briancon. Before you know it you will be climbing once again, this time up another tour climb, the Col d’izoard. The climb is 20km long with an average gradient of 5.8% and a summit height of 2344m. The climbs begins with a 2km section between 7-8% before it flattens out as the road follows the valley. It starts to go up again at a gentle rate until you reach the small town of Cervieres. The road gets steeper as you leave the town and makes its way into the trees, twisting and turning for 7km until you finally get sight of the summit. During the descent we will pass a memorial to Fausto Coppi and Louison Bobet, our overnight stop will be in Gap. Before dinner there will be a briefing outlining the schedule and route for Thursdays ride. From Gap, with the giant mountains of the French Alps behind us we head toward the colourful lavender fields of the provence. At this point we move away from the “Route des Grandes Alp” to give you the opportunity to do one final climbing challenge. 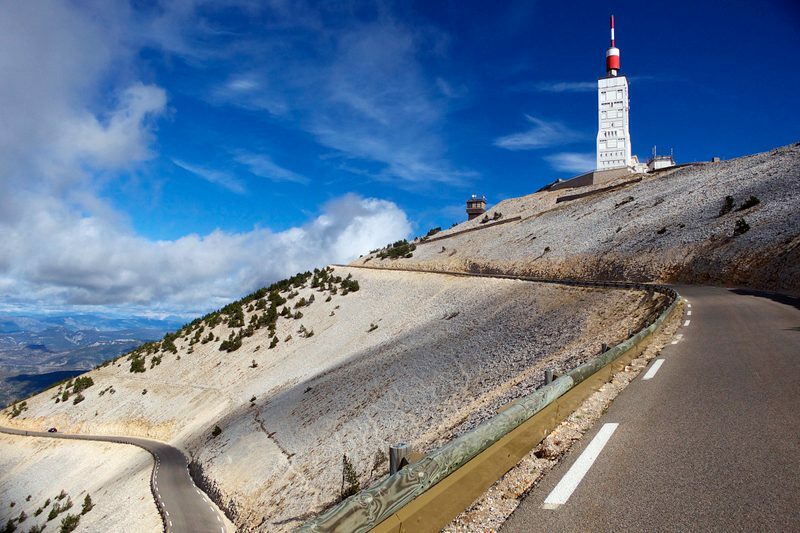 Welcome to the giant of the provence “Mont Ventoux”. At 21km in length with a average gradient of 7.2% and a summit height of 1912m this climb would appear on most cyclists wish lists. The descent to our overnight stay in Bedoin is fast and quite technical in places, after 4km you past the “Tommy Simpson” Memorial. Immediately after the road enters the trees there is a section of really tight hairpins before the road opens out for the final 5km. Before dinner there will be a briefing outlining the schedule and route for Fridays ride. With all the big climbs are now behind us and this epic challenge is finally getting closer to the finish. We give your legs a bit of a rest as we head toward the town of Digne. Todays route is all about the scenery, the stunning “Gorges de la Nesque” is one of the most visited and cycled parts of the Provence. With winding roads and tunnels built into the overhanging rock the views are spectacular making it the perfect place to take a few breaks to admire the scenery. The viewpoint of Castelleras is a firm favourite as it looks over the imposing Rocher du Cire (a giant limestone cliff) named after the wild bees that live there. Before dinner there will be a briefing outlining the schedule for return transfer to Geneva Airport. Well its finally here, your last day of riding takes us over a undulating route to our finishing point in Nice. To begin with we follow a flat road out of Digne to the biggest climb of the day, the Col du Corobin. At a distance of 10km and average gradient of 5% this is the biggest climb of the day. Most of the climb is in a pine forest with gentle gradients and some tight hairpin bends toward the top. Our next climb is the category 3 Col des Leques, which is 6km in length with and average gradient of 5.3% and a summit height of 1146m. The landscape here is made up of rocky outcrops and ridges, lush forests and beep blue rivers providing you with an awe-spiring backdrop to you final day. Once we reach the hill top town of Greolieres, you can freewheel almost all the way to the coast through the beautiful “Gorges du Loup”. Your epic journey is complete with a flat ride along the “Promenade des Anglais” in the heart of Nice and the welcome sight of the Mediterranean Sea. Unfortunately your Geneva to Nice Cycling Challenge as finally come to an end, we will provide a Nice Airport transfer to meet a midday flight. We will provide you with a continental style breakfast each morning and freshly made pack lunches each day. Evening meals with be taken in local restaurants or hotels. A member of the Classic Cycling Tours team will be in the arrivals area on the Swiss side of Geneva Airport to meet you. We kindly ask you to arrange your inbound flights to arrive at Geneva as close to midday as possible. At the end of the trip we will also provide you with an outbound transfers departing Nice Airport for midday flights. Whilst on the Geneva to Nice Cycling Challenge you will be accommodated in 2-3 star hotels,on a shared twin room basis. If you are travelling by yourself you will be paired up with someone of the same gender. If you would prefer a room to yourself then a single supplement charge will be added, please contact us for prices. Please note this option is only available subject to availability. You will accompanied on the road by English speaking guides. We will also provide a support vehicle carry a range of tools, fresh water, energy bars, energy drink (powder form) and an extra clothing you would like to have at your disposal. To begin withcheck our rims and if they are worn, cracked or badly dented replace them with news rims or complete wheel. Secondly, check and if required replace brake blocks. Thirdly check that your wheels are “true” and spoke tension is correct. Fourthly, check and if required, adjust, grease or replace ALL bearings and quick release skewers. Fifthly, check and if required replace brake and gear cables. Finally, check and if required tighten all bolts (esp. crank, bottom bracket, headset, stem and handlebars. Check chain, cassette and chainrings for wear. You should familiarise yourself with some basic repairs prior to your cycling holiday, like fixing a puncher. A member of our team will aways be on hand to help, but having these basic skills will help keep delays down to minimum. If you decide not to bring your own bike, we have a number of bikes for hire. All our bike have carbon frames and are fitted with shimano 105 gearing and compact chain sets. For your own comfort we recommend bring your own saddle and pedals. For pricing and availability please contact us. The better condition you are in, the more likely you are to enjoy the Geneva to Nice cycling route. Getting out on your bike is obviously the best way to prepare for your holiday.Therefore we recommend you adopt an achievable weekly exercise programme that includes some long rides in hilly terrain. However, swimming, running and circuit training are good for developing your aerobic fitness and stamina. At Classic Cycling Tours the safety and well-being of our guests is of the up most importance. Due to the nature of cycling and the terrain you will be riding in, unfortunately accidents can occur. Therefore, it is mandatory that you have Personal Injury Insurance that covers you whilst on a cycling holiday. In the event that you don’t have any cover we prescribe utilizing “Yellow Jersey” cycle insurance. A holiday booking shall be made between Alpsports Limited operating under the name of Classic Cycling Tours, whose registered office is at 40 Queens Grove Road, North Chingford, London, E4 7BT (“,Alpsports Ltd”, the “Company”, “we” or “us”) and the person making the booking (the “,Client” or “you”) and the contract between the Company and the Client shall be governed by these booking terms and conditions. A contract for young persons cannot be made unless at least one member of the party is at least eighteen years of age and is the lead name on the booking. When booking, you: (i) guarantee that you have authority to accept and do hereby accept on behalf of your party, these booking terms and conditions; (ii) confirm that you have brought the terms of the holiday contract to the attention of each member of your party; (iii) hereby agree that you will bring the terms of the holiday contract to the attention of anyone who is added or substituted at a later date; and (iv) guarantee to pay the full costs of the holidays of all those persons mentioned in the booking and of anyone who is added or substituted at a later date. No contract shall exist between the Client and the Company until: (i) deposits or full payment (as applicable) has been received by the Company and a confirmation invoice (an “Invoice”) has been issued by the Company, or (ii) in the case of telephone bookings made within 10 weeks of departure, and where payment is due by debit or credit card, the Company processes your credit/debit card payment and provides oral confirmation of the booking to you, at which time a contract shall immediately come into existence. When making a telephone booking in such circumstances you are deemed to have accepted these booking terms and conditions at the time of making your telephone booking; an Invoice will be sent to you subsequently. When you receive your Invoice, please check all the details carefully to ensure that they are correct, as the Invoice, together with these booking terms and conditions form the basis of the contract between you and us. Information contained in our website also forms part of the booking contract (subject to clauses 5 and 12 of these booking terms and conditions). If there are any discrepancies in the Invoice, please bring these to our attention within 7 days of issue, otherwise we will assume that the details shown are correct and amendment charges may be levied where changes are subsequently necessary. We reserve the right to amend any obvious errors in the Invoice including those which concern the price. We will do this as soon as we notice the error but no later than 7 days after issuing the Invoice and no later than 24 hours before departure in the case of late bookings. A deposit of 30% of the total holiday cost is payable at the time of booking (the “Deposit”). The Deposit is non-refundable. On receipt of the Deposit, the Company will send you the Invoice showing the arrangements booked, the balance payable by you and when the balance is due. For bookings made within 10 weeks of departure full payment for the holiday must be made immediately to confirm your reservation. Where a Deposit has been paid, full payment of the balance (as shown on your Invoice) must reach the Company not less than 10 weeks prior to the start date of your holiday (the “Due Date”). You shall be liable for full payment for all those persons named on the booking and for any and all persons added or substituted at a later date. If payment shall not have been received by the Due Date, the Company shall have the right to cancel the booking, retain the deposit paid and levy cancellation charges. Any money paid by or on behalf of the Client to an agent, under or in contemplation of a contract with the Company, is held by the agent as agent for the Company until the date on which the agent pays the money to the Company. Any payment made by Visa Credit or Mastercard will be subject to a 2% handling fee. Although every effort is made to ensure that the prices quoted on the Classic Cycling Tours website are accurate at the time of publication we cannot guarantee these prices and you must check the price of your chosen holiday at the time of booking, at which time the correct current price will be advised to you. Once your booking has been accepted we reserve the right to levy surcharges in the event of changes to the Company’s costs in dues, taxes or government action (such as increases in VAT or any other government imposed increases) or in relation to the exchange rates that have been used to calculate the cost of your holiday. In cases where the Company has received payment in full from the Client by the due date stipulated for latest payment on the Invoice, the Company will not impose any surcharges after payment in full has been received. Entertainment and provision of food and/or beverages to visitors to the chalet who are not listed on the invoice. If you wish to change any details of your booking you must inform us as soon as possible and confirm the details in writing; any changes to your booking will only be effective once the Company has confirmed acceptance of such changes to you in writing. If we are able to accept the change we will do so without charge, save for amendments to services the Company has arranged on your behalf (such as ski packs, lift passes and transfer seats) where we will charge an amendment fee as charged to us by the relevant supplier plus an additional administration fee of £30 per person for each relevant change. Any changes made within 6 weeks of departure may (at the Company’s absolute discretion) be treated as a cancellation and cancellation charges will apply as detailed in these booking terms and conditions. Cancellations must be notified to us by the Client immediately in writing (sending the letter by recorded delivery, with the postal receipt kept as proof), at 40 Queens Grove Road, North Chingford, London, E4 7BT and will only be effective when we receive the written notice of cancellation at our offices. In all cases of cancellation by the Client the Deposit and any amendment charges will be forfeited. Cancellation periods are calculated from the date your written notification of cancellation is received in our offices. If you cancel prior to the scheduled date of arrival at the chalet, the following cancellation fees expressed as a percentage of the total holiday cost payable by the person(s) cancelling (including, but not limited to, extras such as bike rental and private transfers; excluding any amendment charges) will become immediately payable by you to the Company. If no written notice of cancellation is received and you and/or other members of your party do not travel, cancellation is deemed to have been received in respect of such persons on the scheduled day of arrival at the chalet. If a member of your party wishes to cancel, this may mean that the chalet is under occupied and could result in other members of your party having to pay any applicable supplements to retain the booking. The Company reserves the right to re-sell any part of a cancelled holiday and this does not affect its right to levy cancellation fees. Arrangements for holidays are made many months in advance, and changes can occur. We must reserve the right to make alterations to holiday and website details both before and after any booking has been confirmed. Most of these changes are minor and in all cases we will advise you or your travel agent of any changes at the earliest possible opportunity. If a significant change becomes necessary you will have the choice of: (i) accepting the change in arrangements; (ii) purchasing an alternative holiday from us and paying or receiving any price difference; or (iii) cancelling your holiday and receiving a full refund. In all cases of a significant change, we will pay you compensation as set out in the table below except where the change is made as a result of unforeseeable circumstances beyond our control, the consequences of which could not have been avoided even with all due care which shall include but are not limited to those circumstances set out in clause 9 (Force Majeure) below. No compensation is payable in respect of minor changes and no other claim for compensation and/or expenses will be accepted. The Company cannot accept liability for any costs, losses or expenses incurred by you or any member of your party or pay any compensation if we are forced to cancel, curtail or in any way change your holiday or if the performance or prompt performance of our contractual obligations is prevented or affected by circumstances amounting to ‘force majeure’. Such circumstances shall include, but are not limited to, war or threat of war, riot, civil strife, political dispute, terrorist activity (actual or threatened), industrial disruption (actual or threatened), natural disasters (including but not limited to avalanches or volcanic eruptions/ash-clouds), nuclear disaster, epidemics or health risks, fire, technical problems with transport/machinery/equipment, closure or congestion of airports or ports, border closures, adverse weather conditions, governmental action and similar events beyond our control. The Client hereby accepts responsibility and agrees to guarantee payment for (i) any chargeable services requested by you or any member of your party, and (ii) any damage or loss caused by you or any member of your party. The Company shall be entitled to recover from the Client the cost of breakages (estimated if not precisely known) and/or damage to the chalet and/or Company property (including but not limited to vehicles and equipment) caused (either with or without intent) by you or by any member of your party. We reserve the right to recover these costs from your credit/debit card. The Client undertakes, for and on behalf of himself/herself and each member of the Client’s party, to behave in such a manner so as to not prejudice the Company’s reputation with the owners of its chalets, its suppliers or other clients of the Company. If, in our reasonable opinion, you or any member of your party behaves in such a way as to cause, or be likely to cause (i) danger, upset or distress to other guests, employees of the Company or any third party; or (ii) damage to property, the Company shall be entitled, without prior notice, to terminate the holiday of the person or persons concerned and the Company shall have no further contractual obligations towards such person(s) including with respect to any return travel or transfer arrangements made on their behalf. Such person(s) shall have no right to claim a refund for their holiday (or any part of it) and the Company shall have no liability in respect of financial loss or other claims, damages or expenses incurred by them as a result of such termination. The breach of this clause by any one person shall grant the Company the right to demand immediate vacation of the accommodation by every person named on the booking. The Company accepts no responsibility for the action of its guests and shall not be held liable for any claim or demand made against them (or as a result of their actions) by any third party. We endeavour to make sure that the holiday which you book with us is supplied and the services performed or provided by us are performed or provided using reasonable skill and care. If any part of your holiday is not provided as promised, it is your responsibility to show that reasonable skill and care has not been used if you wish to make a claim against us. We accept responsibility for the acts/omissions of our employees or agents, suppliers and subcontractors where they were at the time acting within the course of their employment or carrying out work that we had asked them to do under a contract of agency or supply with the Company. In all cases (except where personal injury, death, loss and/or damage to luggage or personal possessions results), our liability is limited to the relevant total holiday price of the person(s) affected. It is a condition of this acceptance of liability that you notify us of any claim in writing within 28 days of your return from holiday. In the case of loss and/or damage to luggage or personal possessions (including money), the Company will not accept any liability as it is a condition of your booking (and therefore reasonably assumed by the Company) that you and all members of your party have taken out appropriate insurance to cover such loss and/or damage before travelling. In the event that local restrictions or an injury or other enforced absence to one or more of our employees causes our normal service to be curtailed or restricted, this will not be accepted as cause for compensation claims. All reasonable care has been taken to ensure that the descriptions, facts or opinions on our website are correct to the best of our knowledge at the time of publication. Chalet plans and resort maps should only be used as an indication of layout. Scale and dimensions are subject to error and furniture and room arrangements are subject to change. Opinions expressed are personal to the authors and photographs only relate to a specific destination when specifically captioned. The Client should bear in mind that in relation to the information given about the resort and certain of the facilities available within resort, we cannot guarantee accuracy at all times or that any particular activity will take place as these services are not under our control. Should a problem arise during your holiday, we request that you inform our staff in resort at the time the problem arises so that we are provided with the opportunity to deal with the problem. If you fail to do so you deprive us of the chance to investigate your complaint and to do our best to rectify any problems. If we are unable to resolve matters whilst you are on holiday and you remain dissatisfied, you must write to Alpsports Ltd, 40 Queens Grove Road, North Chingford, London, E4 7BT within 28 days of your return from holiday, giving all relevant information. If you fail to follow this simple complaints procedure, your right to claim compensation will be affected or even lost and we regret that we cannot accept liability in respect of any complaints which are not notified entirely in accordance with this clause. It is a condition of booking that all persons named on the booking have insurance which provides sufficient travel and sports insurance. As a minimum, such insurance should cover medical costs, mountain rescue and emergency repatriation, third-party liability, travel disruption, cancellation and personal effects. Insurance policies usually specify the maximum amount covered in the event of any loss or damage and most do not cover mobile telephones and some may have exclusions for certain “extreme” sports. We suggest you and the members of your party check the limits of cover of your chosen policies. The Company cannot accept responsibility if you or any members of your party do not take out adequate travel insurance or where any losses exceed the amount for which you/they can claim under your/their chosen policy. We strongly recommend “Yellow Jersey Cycle” insurance if you do not have any cover. You should plan to arrive at your chalet accommodation after 2.30pm on arrival day and leave by 11am on your departure day. If you wish to leave luggage at the chalet before 2.30pm on the arrival day, this can be arranged but we ask that notice is given prior to the date of your scheduled arrival. Guests use the hot-tub at our accommodation at their own risk and the Company can accept no responsibility for accidents/injuries sustained while using these facilities. Children must be supervised at all times. The Hot-tub is normally out of use for at least one day per week while they are cleaned. Should any leisure facility become unavailable for any reason, we cannot guarantee being able to repair or replace it during your holiday, and do not offer compensation for inconvenience or curtailed use in such an event. For our catered chalet programme we have a well-developed Food Allergy Policy in place, with a view to avoiding any allergic reaction incidents, and shall exercise reasonable care to avoid specified food and drink ingredients if special diets are agreed at the time of booking and confirmed in writing (by email or registered post) at least 14 days prior to the scheduled arrival date. However, in choosing to stay with us, you accept the following facts: that no food allergy system can ever provide a 100% guarantee against any contact with a specified foodstuff; that items such as eggs, dairy products and nuts are constantly present in chalet kitchens and dining areas; that our staff cannot police what snacks third parties, including other guests, may bring into contact with the allergic person. Extreme Food Allergies: where a food allergy is so severe that the slightest exposure to the substance in question could cause a life-threatening anaphylactic reaction (for example where a reaction may be triggered other than by actually eating the foodstuff – such as by smell alone, or by minute trace elements on the hands of a staff member or another person), you must advise us in writing of the severe nature of the allergy at the time of booking. We then reserve the right to advise you that, in our considered view, the controls we are able to implement in the ski chalet environment are insufficient to guarantee the relevant person’s safety, in which case, should the relevant person (or in the case of a child, it’s legal guardian) choose to proceed with the booking, that person does so entirely at their own risk, and would be asked to confirm this in writing in order to confirm the booking. If you fail to advise us of a known extreme allergy at the point of booking, you will be in breach of contract, and we will therefore have no liability to you or any other person in the event of any incident. Complimentary internet access via wifi is available in our chalets. Please note, however, that we cannot guarantee continuous and uninterrupted internet connection due to technical circumstance out of our control. Internet is intended for straight-forward web browsing and checking of e-mails, it is NOT for live streaming or downloads (including music & films). All of our rooms are equipped with a safe for securing guests’ valuables and all bedrooms have been fitted with lockable doors. However, we cannot be held responsible for the damage to, or loss or theft of personal belongings or ski equipment from our chalet accommodation (see also clause 14 (Insurance). Smoking is prohibited throughout our chalets. A guest who breaches this policy will be liable for any cleaning costs resulting from such breach, and accepts liability for all consequential damages sought against Alpsports Ltd by its other guests and/or the property owners. Headings within these booking terms and conditions are for reference purposes only and all images are intended to give a general impression only. These booking terms and conditions and any contractual and non-contractual matters arising from them are governed in all respects by English law and shall be subject to the exclusive jurisdiction of the courts of England and Wales. We did the Geneva - Nice cycle tour with Steve and Anna in a small group in September. The week was excellent from start to finish, and I would highly recommend the tour to any keen cyclists. The riding was obviously excellent, and the support on the road from Anna was great.